You get more than just highly nutritious juices from the Tribest Green Star Juicer 3000. This is the ultimate juicer/food processor combo that will eliminate the need for many other small appliances in your kitchen. Toss out that inferior juicer and that huge outdated food processor and make room on the counter for this award-winning combination machine. Juicing is now being recognized as the best way to cleanse the body, lose weight, and restore your body's natural energy reserves. 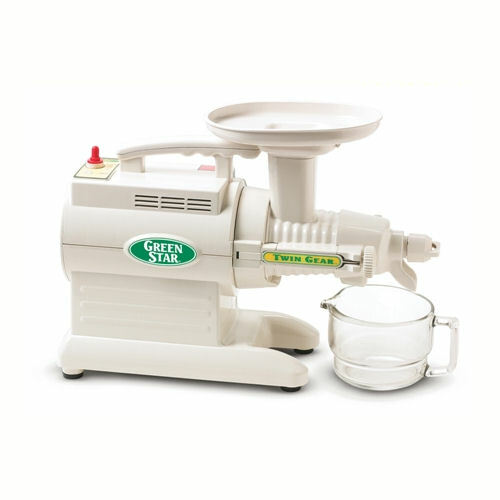 The Tribest Green Star Juicer 3000 is a twin gear juicer, which is the most efficient processing to be found on the market today. Food processing as well as juicing. More nutritious juice with less pulp. Nice variety of accessories for beginners. This juicer is easier to clean up because it delivers drier pulp. Drier pulp simply means there are more nutrients contained in the actual juice! Yet, with all the attachments that come with the Tribest Green Star 3000 Juicer you will be able to make other healthy foods in it as well, such as delicious homemade rice cakes or whole grain pasta. The Tribest Green Star Juicers comes equipped with all the accessories and attachments which make it extremely functional in the kitchen. This is the ultimate package that turns your healthy juicer into a convenient food processor. Tax only charged for Arizona customers.